Todd and Josh are hanging out. 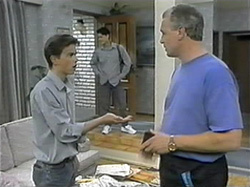 Jim overhears Todd talking to Josh about getting a new pair of sneakers, but Jim says his own are perfectly fine. He advises him to ask Helen, but relents and gives Todd $35. Todd tells him that it won't be enough – Josh's were $70! Jim is shocked and says it's too much. He finally agrees to $70, but not $190 which Todd really wanted! 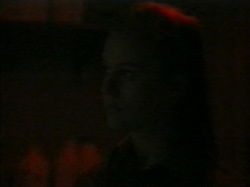 Melanie sees Eric who is in Erinsborough looking for an outlet for one of his shops. He asks after Sky and tells her that he's grown very fond of his daughter. Melanie comes in and sits with Christina. She's upset about her conversation with Eric and tells Christina that he's only Sky's biological father – Joe is her real Dad. She reckons Eric's got so much money he can do whatever he wants. MELANIE: I know, I know. But Joe's a real underdog in this and it makes me sick. Christina warns her that the only reason to marry is for love, but Melanie says she can't sit back and do nothing – Eric has such an unfair advantage over Joe. Christina tells her she'll have to talk to Joe and tell him that she can't marry him. 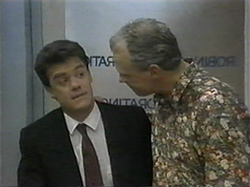 Paul invites Jim out to a night on the town, but he says he isn't in the mood. Todd wants Cody to just go over and talk to Melissa, but she won't. Josh comes in and tells Melissa that he's heard about her and some guy in the dark room. Melissa says that Cody has been spreading gossip about her. Cody storms over and denies it. Melissa tells Josh that the guy just took her by surprise and Cody backs her up – the guy just jumped on her. Josh calms down a bit. Melissa and Cody make up. Josh vows to flatten the Phantom Kisser when he finds out who it is! Paul comes in with Caroline and drinks orange juice straight from the jug! Christina is unhappy to hear that Paul is going out – she is in the middle of cooking them a nice dinner. She's even less impressed when she hears that Paul is going out with Jan Daly! When Paul has gone upstairs, Caroline tries to cheer her up and says they'll have a great night in on their own. Christina does not look convinced! Melanie and Joe are sitting quietly watching TV. MELANIE: Joe…you remember that conversation we had? JOE: Yeah, you and me, and old married couple! JOE: You know, a lot of people thought me and Kerry were a weird combination when we started stepping out and we soon showed them! MELANIE: Yeah, it worked, didn't it? JOE: Too right it did. Look, er, I hope you don't mind, Mel, but I had a quiet word to Harry today about the marriage. JOE: No, you could have knocked me down with a feather. He thought it was a marvellous gesture on your part. Christina is waiting up for Paul to come home. Caroline rolls her eyes and goes off to bed. Christina asks Melanie if she talked to Joe about getting married, but she says she hasn't had a chance. Jim comes in and asks if Paul is in. Christina tells him that Paul didn't come home last night, but just then Paul stumbles in looking rather the worse for wear! Christina's face is a picture. Josh is still moaning about the Phantom Kisser but finally admits that it wasn't Melissa's fault. Cody teases him that the Phantom Kisser is a very good kisser(!) and he doesn't look too chuffed. Cody doesn't think they'll ever find out the Phantom Kisser's identity is he's that shy! They talk about some possibilities, but don't come to any conclusions. 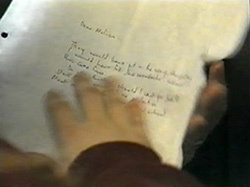 Melissa opens her letter and finds a note from the Phamtom Kisser inviting her to meet him in the dark room after school! Melissa isn't sure, but she does want to find out who it is. Cody says she'll come with her for protection and to put the light on at the right moment! Christina sees Joe and sits down with him. He asks her what she thinks of Melanie as wife/mother material and starts to tell her about the proposal, but of course she already knows about it. She tells Joe that she thinks it's a crazy idea. CHRISTINA: I can't believe that you could take advantage of someone as sweet and loving as Melanie. CHRISTINA: You don't know the heartache she's been through, do you? Joe points out that it was all Melanie's idea, but Christina says Melanie is very kind, and he can't take advantage of her nature. He'd be preventing Melanie finding her Mr Right. Melanie tells Paul that the gift shop float is all under control – Christina has sorted it. Caroline wonders where Christina is going with her modelling career and Paul reckons Christina isn't up to the competition(!) They decide that instead of laughing at her, they should be enthusiastic. In the outer office, Joe comes in to see Melanie with some flowers. They both talk at once, telling each other that they don't think it's a good idea. They laugh and realise they're on the same page. MELANIE: When I think about it, it was a pretty stupid idea. JOE: What's stupid about marrying me?! Josh and Todd are chatting at the lockers. Todd wants to buy his sneakers ASAP and wants to spend more than the $70 that Jim gave him. He wonders if he can get an advance on his paper-round from Josh's dad to add to it. Josh wonders where Melissa has got to. He asks a random boy if he's seen Melissa and he suggests trying the dark room! Melissa and Cody are waiting in the dark room. Melissa isn't sure about this, but Cody says it's “research”! Melissa worries that he might be a psychopath, so Cody says she'll hide in the cupboard. Melissa puts the light off. 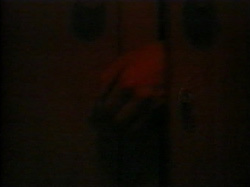 We see a hand opening the door and creeping in to the dark room. Cut to Josh outside the school. Todd rushes past him, having forgotten his cricket shirt. Inside, Melissa lets Cody out of the cupboard and tells her that the Phantom Kisser has struck again! Josh comes in and asks what's going on and Cody tells him! He's not impressed. Melissa says that Josh must have passed the kisser in the corridor. Josh looks cross.